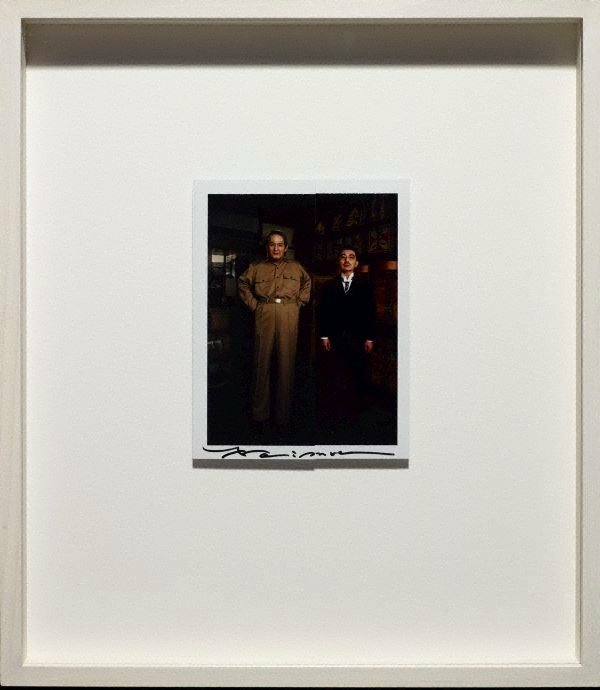 Yasumasa Morimura’s ‘Requiem’ series inhabits and reinterprets iconic moments of the 20th century. Composed in four chapters, each of the photographs and films in ‘Requiem’ reperforms a moment when ideological tensions were embalmed on film. ‘Spinning a thread between the light and the earth’ is the final photograph of the final chapter. Chapter four, entitled ‘1945 - a flag on the summit of the battlefield’, commemorates the year that World War Two ended and Japan accepted defeat. After the violence of these events, Morimura chooses to depict Gandhi, the symbol of non-violent national independence and passive resistance, to close his series. In imitation of, and homage to Margaret Bourke-White’s 1946 portrait of Gandhi for Life magazine, Morimura-as-Gandhi leafs through images of the then future Vietnam war (including Eddie Adams’s Pulitzer Prize winning image ‘Saigon execution’ 1969, which Morimura restages in the ‘Requiem’ series as well as in ‘Slaughter cabinet II’), the original Gandhi portrait, and Veláquez’s ‘The fable of Arachne (Las Hilanderas)’ 1656-58. Veláquez’s exploration of the power of a picture-within-a-picture portrays Ovid’s story of Arachne, a mortal weaver, who challenged the deity of weavers, Athena, to compete: each would create a tapestry. Arachne’s tapestry is depicted, featuring the fate of mortals who pit themselves against the gods: just as Morimura has chosen to do in his ‚Requiem’ series. When Bourke-White’s portrait of Gandhi was originally published in 1946 it was accompanied by an article on the Mahatma’s gruelling experiments on his body, all of which seek to spiritually realize that ‘vows taken should be fulfilled in the letter as well as in the spirit’ . Gandhi uses his corporeality as a vehicle to access deeper meanings, just as Morimura’s self-portraiture has always done. ‘Unexpected visitors’ and ‘OSWALD’ are in part working documents for larger photographs in the ‘Requiem’ series. Like sketches, these Fotorama (Polaroid) photographs are used to test the compositional elements of a planned work. ‘Unexpected visitors’ opens Chapter four of the ‘Requiem’ series; here Morimura examines the concepts of national identity and submission as he reperforms both American General MacArthur and Japanese Emperor Hirohito as they meet for the first time in 1945. ‘Unexpected visitors’ is shot in the tea shop owned by Morimura’s father (now deceased) in Osaka, accentuating the political statement that private history can become communal memory. ‘OSWALD’ is from Chapter one, Seasons of passion (as is the MISHIMA DVD from 2006) which is concerned with the intersection of ideological and physical conflicts catalysed by impassioned individuals. In this reperformance of Robert H. Jackson’s 1964 photograph capturing the murder of Lee Harvey Oswald (John F Kennedy’s alleged assassin), a subject of violence becomes the object of violence. In the Fotorama, Morimura appears as Oswald only whereas in this work’s final version, Morimura appears as every character in the image. Signed l.c. sheet, ink "Morimura Yasumasa". Not dated. Signed label in Japanese script l.c. verso frame, black ink "Morimura Yasumasa". Not dated.